Coumarins are considered to be privileged structures due to their broad range of biological properties, including anticoagulant, anti-neurodegenerative, antioxidant, anticancer and antimicrobial activities. 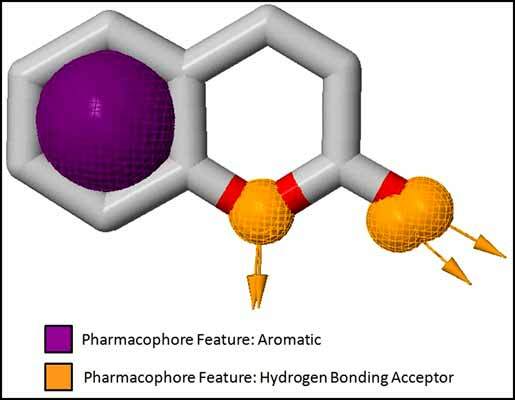 These interesting properties of coumarins can be ascribed to the chemical attributes of the 2H-chromen-2-one core; its aromatic ring can establish a series of hydrophobic, π-π, CH-π and cation-π interactions, and the two oxygen atoms in the lactone ring may hydrogen-bond to a series of amino acid residues in different classes of enzymes and receptors. Additionally, the double bond in the lactone helps to make the entire system planar, allows charge delocalization between the carbonyl group of the lactone and the aromatic ring and confers the characteristic fluorescence of this class of compounds, which can be explained by their preventing the trans-cis transformation of the double bond under ultraviolet (UV) irradiation. It is the possibility of radical delocalization in the 2H-chromen-2-one nucleus that makes most of the coumarins good antioxidants by acting as free radical scavengers, although some coumarins (mainly hydroxycoumarins) may also prevent the formation of free radicals by chelating metal ions. In this review, we provide a systematic analysis of the most important aspects surrounding the development of coumarins as antioxidants. Our analysis includes the synthesis of some complex antioxidant coumarins, strategies for structural modification to improve their antioxidant activities, qualitative/ quantitative structure-antioxidant relationships studies and the main in vitro assays used to evaluate their antioxidant properties. Antioxidants, Coumarins, DPPH antioxidant assay, Free radicals, Privileged structures, Structure-activity relationships. Faculdade de Farmácia, Universidade Federal do Rio Grande do Sul, Porto Alegre, Rio Grande do Sul, 90610-000, Brazil.